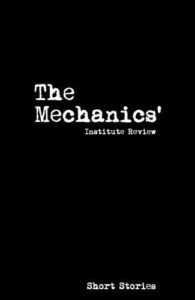 I decided to take my Creative Writing MA at Birkbeck because of The Mechanics’ Institute Review, an annual collection of short fiction that showcased the best writing at the college. At that time, the Review was produced by MA students as part of a publishing module. In the first few weeks of term, it became clear that everyone wanted their story to be selected. For some, including me, it represented the first ever chance to be published. Unfortunately, the module was cancelled in my first year because not enough people signed up. Everyone wanted to be in the book, but being an editor made you ineligible. Julia Bell, the lecturer who set up the Review ten years earlier, wouldn’t let the project die. Instead she called for volunteer editors and built a team that included Birkbeck alumni as well as current students. MIR 11 was published that year and I was fortunate enough to have my story Sowing Seeds included. I had only written one short story before I started my MA. I had never shown my writing to anyone else. I had never called myself a writer. Seeing my name in print, going to the launch party, holding a physical copy of book that included my work was a gamechanger. It legitimised a creative spark that had, up until that point, just been a hobby. When I was a little girl in the early 80s, I felt like having my name printed out in ‘computer writing’ on a piece of paper meant I was famous. MIR 11 allowed me to live out that dream as an adult. Julia had a vision for MIR. She didn’t want it to be a university publication that just printed work from Birkbeck students. She wanted to open it up to all UK based authors and she wanted to combine the other extra-curricular activities (like the Writers’ Hub website and the Hubbub live reading event) offered at Birkbeck under one banner. I was about to start my PhD at Birkbeck and becoming the Managing Editor for the online counterpart to the Review was the perfect way to help with my fees and to share my experiences with other budding authors. At MIROnline, I manage a team of about twenty volunteers. We have readers, copy editors, bloggers, features writers, and social media experts. 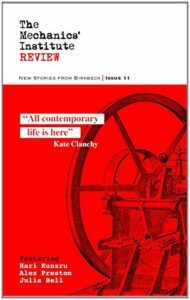 We publish fiction and poetry from writers across the UK and provide an in-depth copy-editing experience for those writers. We run live reading events and free writing workshops that are open to all. I am a secondary school teacher and sometimes the combined workload is overwhelming. In theory, my weekly schedule is Monday MIR, Tuesday teaching, Wednesday PhD study at home, Thursday PhD study in the Wellcome Library, Friday and Saturday teaching, and Sunday relaxing. It doesn’t always work out that way! My research focuses on anxiety and creativity, and sometimes the stress of a MIR deadline gives me some first-hand experience of this link. That being said, I have an amazing team of volunteers who always step up when I need them. I also have the support of Julia, Toby Litt, and Sue Tyley, the experts who give us a professional sheen. In my research, I am looking at ways for writers to use the mental barriers they might face to fuel their creativity rather than block it, and this definitely comes in to play when mentoring new writers. Of course, we publish the work of experienced authors too and I learn a lot from their methodology and practice. My aim as Managing Editor is to offer quality university and industry level experience for anyone who wants to engage with us. For the volunteers, I hope that they learn and develop as writers and editors. For the authors and participants in our events, I hope to pass on the feeling I had when I held the physical copy of MIR 11 in my hands. You are an author now. Legitimate and celebrated. Melanie Jones is the Managing Editor of MIR Online and a PhD student at Birkbeck University where she researches the links between anxiety and creativity. Melanie teaches at a secondary school for pupils with anxiety and other emotional barriers, autism, dyslexia and school phobia. Melanie was long listed for the 2018 Bristol Prize and shortlisted for Poetic Republic’s Short Fiction Competition. Her work can be found in the following anthologies: Kissing Him Goodbye and Other Stories, and The Mechanics’ Institute Review issues 11 and 13. Melanie is currently working on a collection of semi-true short stories.